It was Sunday morning, 8:00 a.m., just across the Elkhart Indiana border in Michigan. It was eight degrees below zero. Russ had fifthwheel shoppers coming in from Florida and Texas at 11:00 to see the Americana Model with living room and bedroom slide-outs and he had to get the coach up to a comfortable temp in three hours. Everything in the coach was eight below zero; the furniture, the carpet, the cabinets, the ceiling, the kitchen sink. In fact the whole interior of the fifthwheel was one big heat sink. Getting all of this very cold material up to room temp seemed to be a daunting task. Russ fired up the 35,000 BTU furnace, pulled down the day and night pleated shades, turned on the big white ceiling fan for improved air circulation, and let her rip. Much to Russ’ delight, by 11:00 the coach was a balmy 68 degrees. Eight degrees below to sixty-eight degrees above in three hours. Amazing. The shoppers from warmer states were very glad to be sitting and talking to Russ in a nice comfortable coach rather than an igloo and Russ was totally pleased with the quality of our insulation and the fact that the coach was built to our RT specification for insulation. Quality was paying off, keeping everybody toasty. Then as an experiment, Russ wanted to see how long the 7 gallons of useable propane (one standard tank) would last in this frigid weather with the thermostat set at 68 degrees. It wasn’t until 7:00 a.m. on Thursday morning that the propane finally ran out. The warmest it got over that period of time was seventeen degrees above zero on Wednesday afternoon. If the furnace had run full time, rather than cycling on and off as it did, the propane would have been used up by Sunday night. Talk about good R values! Just like in a house (or a person), 80% of all heat loss and gain is through the roof. So if you we plan to design and build a true 4 season insulated fifthwheel, we better build a roof up that is up to the job. Above you can see the window side cornices and the day and night pleated shades that make up the thermally efficient window coverings of the Americana model. How’s this for tough in very cold snow and ice? 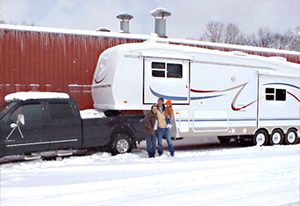 The Hahns from South Dakota picked up their new 38/39RL in February in Elkhart. During their checkout, they spent 3 days and nigths outside our service center. They were warm and comfortable inside and our true 4 seasons insulation prevented the roof snow from melting. We are the toughest in both hot and cold environments. This poor fellow was recently photo’d in a Las Vegas campground. The fifthwheel is a major Indiana brand. The owner is a full-timer and we are sure the salesman told him that his RV roof airs would do the job. He had to “jury-rig” an additional air-conditioner (on wood stilts) in order to survive in the desert heat. Our roof structure uses double insulation and an additional vapor barrier to insure our 4 seasons insulation capability. A majority of fifthwheels are built without this exacting insulation spec and you can understand why the fellow's fifthwheel in the above picture just couldn't handle the Las Vegas heat and why 2 roof airs and 2 furnaces have become a norm for other brands. Also, remember that windows have an “R” value of 1 - its like having nothing there, dual pane windows have an R value of 2, almost ike having nothing there. So the larger your windows, the less well insulated your coach will be. Therefore, one of the parts of our RT Specification is window size control. We make our windows just big enough to allow for good viewing and ventilation and to let light in, but no bigger. Huge windows designed to sell RVs at RV shows, look great, and they really don’t cost very much up front sometimes they cost less per square foot than our laminated sidewall material, but they cost you more down the road. When windows are too big: well greenhouses are difficult to heat and air-condition. 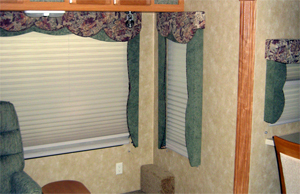 Our window coverings are extremely important for keeping out the hot or cold. Pulling down the day and night pleated shades behind the side cornices creates an excellent air damn that impedes convection currents and drafts. Our window coverings act just like storm windows or thermal pane windows in that they increase the R value of the window opening. Another way we control the quality of comfort during temperaure extremes is to keep the slide-outs down to a minimum size. Long and high slide-outs are easy enough to make, but when they get too big the total outside exposed area of the slide-out may increase to a point where we would have to add a second furnace and/or roof air. None of our customers have told us that a second furnace or roof air is a good idea, and most of our customers are full-timers who end up in the Western desert in the hot summer or don’t get out of Michigan in time to avoid the beginnings of winter. Size control of slide-outs also helps maintain the beam effect of our sidewall structure over the slide-out space. Long unsupported spans create a tendency for the beam area over the slide-out to twist or deflect under compression or torsional loads. 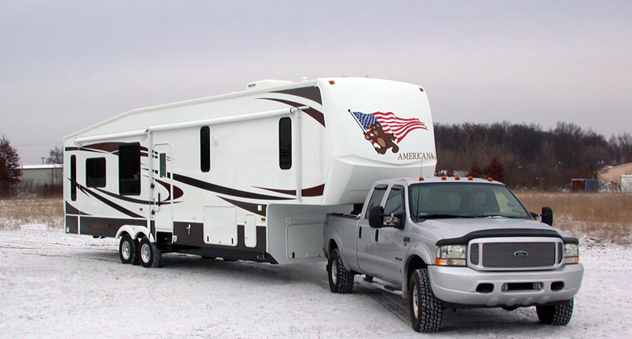 To Save costs, most RV manufacturers, DO NOT insulate their big main slide-out floors. That is a large area to expose to heat and cold without insulation. Our RT spec. calls for the big main slide-out floor to be insulated with space age insulation material with an insulation efficiency similar to our RT spec. for our vacuum bonded foam slide-out walls and main side-walls. None of our customers have reported inside wall condensation or frost, as could happen in the cold, if the walls weren't up to the job. The goal is to allow our bonded sidewalls, made of one and one half inches of block foam, to do their job and keep the inside toasty warm in the winter and cool in the summer. The bonding process allows us to use the same foam that is in coffee cups. Even though a coffee cup may be only 1/8 of an inch thick, it can make a scalding cup of coffee a handleable commodity. Our RT spec for bonded walls with with block foam gives us fantastic insulation roughly equal to at least four inches of fiberglass bat insulation. RVs built to a less costly specification are often disappointing performers in temperature extremes. As an example, two inch fiberglass bat insulation is normally used by most manufacturers in their hung fiberglass, non-laminated sidewalls or aluminum skin non laminated products. The standards of our industry require testing data to support R value claims. We are aware of only two RV manufacturers who have paid to have their R values laboratory tested, and both are out of business today. Therefore, most of the R values quoted in brochures by RV companies are cooked up by the sales manager or by an ad agency. As they see it, the bigger the numbers, the better. Very frankly, we haven’t paid for R value testing either, because to do so is quite expensive. We will, from time to time, quote R values which are printed on materials that we use, but not the total constructional composite R value. All we can tell you is that our R values are good enough for one tank of propane to keep our RT model with living-room and bedroom slide-out at room temperature for four days and four nights of sub zero weather, and at the other end of the spectrum, our roof air blows cold in the Kitchen, Living-room, and Bedroom on hot summer afternoons in the Mojave.